The NIMBioS Working Group on Habitat for Migratory Species enjoys a visit to the mountains during its last meeting at NIMBioS in May. 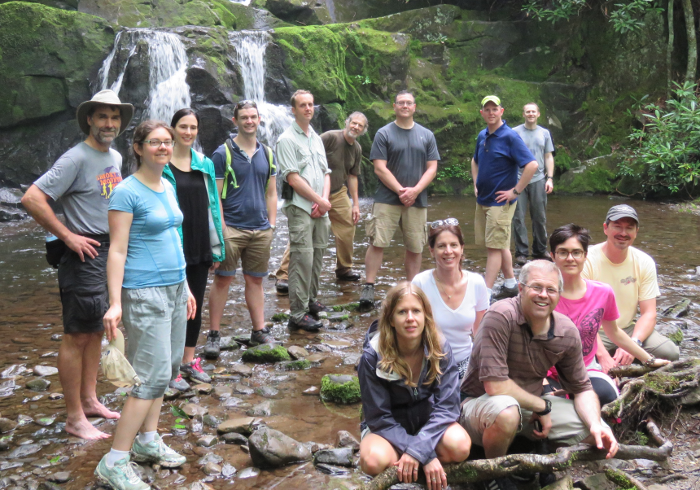 (From left) NIMBioS Deputy Director and tour guide Chris Welsh, Julia Earl, Christine Sample, Sam Nicol, Brady Mattsson, Gary McCracken, Wayne Thogmartin, Richard Erickson, Tyler Flockhart. (Seated from left) Ruscena Wiederholt, Paula Federico, Jay Diffendorfer, Laura Lopez-Hoffman, Darius Semmens. A new management guide for selecting habitat- and patch-specific metrics in spatially-structured populations was published yesterday in Ecological Indicators. The paper is a result of efforts by the NIMBioS Working Group on Habitat for Migratory Species. The paper reviews the many ways to measure the contribution of a habitat to a population. Some populations, like migratory birds, use many different areas during their lifetimes, making managing such populations a challenge. Which areas should be managed? Not all areas are necessarily equal. The Group asked the question: What is the best way to measure the value of a habitat to a population, given a particular management objective? The paper reviews techniques to measure contributions from an applied, management point of view and argues that the best metric for a situation depends on the management goal. The Working Group began meeting in 2014 and has met four times at NIMBioS, concluding its final meeting in May 2016. Co-organizers are Wayne Thogmartin, Jay Diffendorfer, Ruscena Wiederholt, and Brady Mattsson. This entry was posted in ecology, publication, research, Wildlife, Working Groups and tagged ecology, publications, research, wildlife, Working Group. Bookmark the permalink.